Daan Roosegaarde has been one of my favorite modern Dutch artists since I saw him once in the TV show De Wereld Draait Door, where he discussed his work Crystal, Marbles and Dune. This is because his way of thinking and working; he combines art with technology and tries to improve the world. Especially the first work, Crystal, caught my attention right away: thousand and one light rocks that interact with people: the lights functions as a ‘digital campfire’, each crystal contains an LED light charged via a power mat. People can move them, add them and even take them with them, once they are moved the basic breathing of the crystals changes. 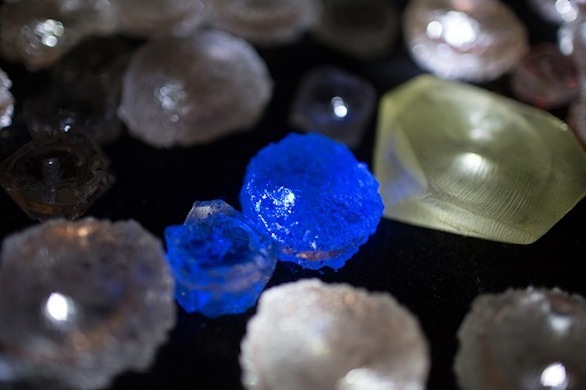 The lighting behavior of crystals moves from ‘excited’ to ‘bored’, keeping visitors curious. The lights become social and people can share their stories about the lights. He said himself: you can share or steal them and sharing is the new having. I think this is a good point because in light of the economic crisis and the earths resources running out we have to change the way we life now and make a new world and I think sharing is a good way to solve a lot of problems. His side-specific art installation Dune is also one of my favorites and is the work I have chosen from the Stedelijk Museum. A landscape of ‘Wuivend Koren/Waving Wheat’, which interact with human behavior; your motion and sounds. To watch, walk and interact. 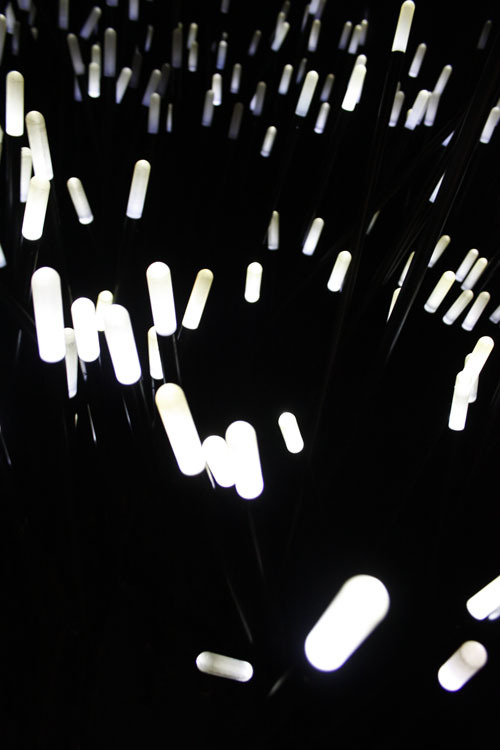 The work is made of large amounts of fibers with lights in it that brighten according to the sounds and motion of passing visitors. A new way of making a futuristic nature in relation with urban space. Nature and technology together. I saw this work on videos before I saw it in real life in the Stedelijk and that is a world of differences. By interacting yourself with the art work it makes you feel part of it and that gave me a really good feeling. The sight, the sounds, the lights, the change of it made it really special for me and is the reason why I really like it. The work was shown in museums in Amsterdam, Rotterdam, London, Tokyo and Hong Kong. The specifications are: modular system of length 100 cm, width 50 cm, variable heights. Hundreds of fibers, LEDs, sensors, speakers, interactive software and electronics; variable up to 400 meters. The last couple of years Daan Roosegaarde had a lot of publicity, his works has become more known, he was a regular guest on Dutch television on shows like De Wereld Draait Door, has won this year Danish Index award, which is regarded as the most important design price, for his work Smart Highway, he has his own studio called Studio Roosegaarde with establishments in the Netherlands and Shanghai. Last summer 2013 he was a guest of the Dutch talk show ‘Zomergasten‘ which was really nice. This episode of ‘Zomergasten‘ is the reason I became a big fan of him and his work, because that was a good way to really get to know him and his ideas. ‘Zomergasten‘ is a Dutch television program broadcast every summer, in which about ten known people, writers, artist, politicians, scientist are invited. They are allowed to show videos or fragments of videos of things that are important for them, inspiration wise, learning wise or which they have found intriguing there whole life, and talk about with the host of the show. An interview of Frans Bomet about the use of mobile phones in 1999. It’s in Dutch and no subtitles. What funny is about this video that it shows how fast the world can change, almost 15 years ago not all people had a mobile phone and didn’t even want it and look at the current situation everybody has a phone and more important the way it’s used now, a lot of people can’t life without it. A video of the work Solar Sinter by Markus Kayser. He made some kind of machine, a bit like a 3D printer, which absorbs the sun light which then goes through a magnifying-glass and then gets sprayed on sand which becomes hard because it crystalize. So you can make sculptures with only sun and sand, so imagine the possibilities, maybe in the future it can make houses in the desert. This is maybe the most intriguing nature documentary I’ve ever seen: Ameisen, die heimliche Weltmacht (2004). In the Zomergasten episode they only showed fragments but this is worth to watch completely. I had already seen it on a BBC nature documentary and watch it again after the Zomergasten episode. For me this show how much we as humans still can learn from nature and other animals, the way the ants work together, it looks like their ‘city’ is built by one designer, one mind, but of course it’s made by a million ants. I think the reason why I feel attracted to Daan Roosegaarde is because his way of thinking, most of the time his works are ideologies to change the way we, as people, are living now. He really tries to change the world. I think that that is very important in this time. There are so many problems and in many ways you can say we are destroying the world, and I think that art is a good platform to change the point of view of people, and make people aware of problems in the world. Daan Roosegaarde is one of those artists, he is an innovator. Are we moving forward, are we evolving as people or have we stopped evolving and are we becoming more human or machine? We got to raise our angle of view, to learn, to grow and make the world a better place. Human and inventions have lived for years together and I think it becomes one (humans and technology), because if you look back in history, humans always have tried to improve themselves and improve life, like fire or the wheel; those are inventions, improvements of life. Technology is part of human’s evolution. We got to work together as one collective.